According to Richmond, the framework within which the quadrations are laid out have the Planets ruling the rows of the framework. Additionally, he stated that the columns should be used as an indicator of the time frame to consider when delineating for any position in the spread. The diagram on the left is segmented into 3 parts, representing the 3 periods of time being Past, Present and Future. Working from the right, the Past is represented by the 1st and 2nd columns and part of the 3rd column. The 4th column and part of the 3rd and 5th columns represent the Present. The Future is represented by the remaining part of the 5th column along with the 6th and 7th columns. Richmond did not signify what part of the 3rd column was to be used as the representative portion to assign to the Past. In addition, he did not signify what part of the 5th column was to be used as the representative portion to assign to the Future. For this study, the designations will be as shown in the diagram. The divisions marked as such are purely from my own psychic and intuitive guidance, where each time frame contains a nearly equal amount of card energy. 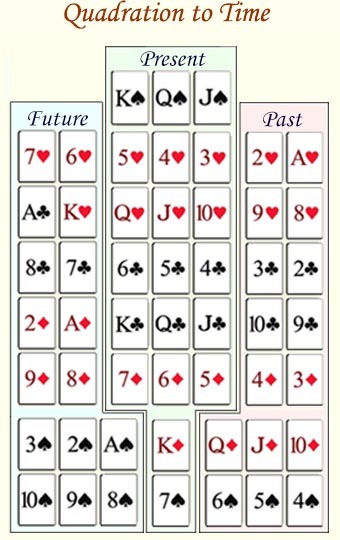 The top row (shown with the King, Queen and Jack of Spades) is sitting above the remaining cards in the Present columns. Richmond called this row of cards ‘Sun Cards’, and stated that they were not under the influence of any of the planetary rulers. However, Richmond did not go into detail as to how these 'Sun Cards' should be included in a reading, and in his diagram they were not separated so distinctly. Thus, it is important that each reader develop their own understanding of this crown line in order to relate how it should be included in a reading. For this study, the crown line remains outside of the planetary influences even though Pluto has been assigned the planetary ruler of this row. Here, Pluto rules the crown line from it's spiritual aspect, essentially representing the portal through which Divine Light nourishes the Soul incarnation. The position of any card in the framework indicates where the strongest and nearest effects concentrate for that individual. If the card is in the past, it shows the forces that are affecting it for a distance of 2 cards will indicate something recent. If in the future, the indication is of something soon to come. This shows how emblems are indicated personally. When taken as a whole, the framework provides the structure through which the vastness of time can be segmented such that the general indications suggest individuals or events far in the past or future coordinating with the present. For this study, the general indications relate to the fundamental principle of Cause and Effect. Thus, an individual can see right away whether the current incarnation is largely the effect of a previous cause (indicating the Past), or if the effect has been integrated, forming the platform from which the new cause originates (indicating the Future). When the Present is indicated, it shows a balancing of cause and effect such that both are in effect simultaneously. Please note, these terms are largely symbolic and should be considered metaphorically. Richmond presented a section on the groupings of cards based on their color, where black represented darkness and red represented light. Therefore, for a line of black cards it would indicate darkness in ones life, and a line of red cards would indicate light, or happy times. From my own observation however, these groupings have come to be termed differently. Where a line of black cards is shown, it represents a shadow appearance, requiring that the individual look within to identify the source as a means of reaping the rewards. When a line of red cards is shown, it indicates the wellspring of opportunity available to the individual. If the individual does not make use of the opportunity appropriately, it will be like a talent that goes unused--and therefore, in essence, taken away. As with the descriptions stated above, these terms are indicated metaphorically.